A historic outdoor swimming pool in Cornwall has been saved from closure. 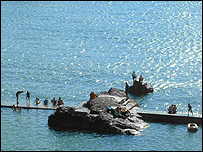 The 70-year-old salt water pool at Summerleaze Beach in Bude had been earmarked for closure following safety concerns. But on Monday night, councillors voted to keep the pool open during the summer holidays and agreed to look into measures for the long term. Work on the pool, including walkway repairs and cleaning, will now start for re-opening by the end of May. North Cornwall District Council closed the pool just before Easter for health and safety reasons on the advice from the Health and Safety Executive. A petition calling on the council to re-open the pool has been signed by thousands of local people, with many worried the popular resort would suffer if the pool remained closed during the summer months.